There are basically two types of of band saws, two or three wheel. When buying a saw for the first time, the three wheel saw appears to be the best bet. I gives heaps of throat (distance of cut between the down traveling cutting side and the upward return side of the blade) for cutting larger widths of wood. The 2 wheel saw has the opposite effect of above, the blade only changes direction twice and blade life is 1/3 longer than a 3-wheel model. Larger wheels produce the flywheel effect and provide more drive surface area. As a rule of thumb the longer a band saw runs on after it is switched of the better it is, it has keep-going ability. However take note that some larger band saws have a break to stop the blade when it has been shut down. Remember the down side to the 2-wheel saw is that it has much less throat. 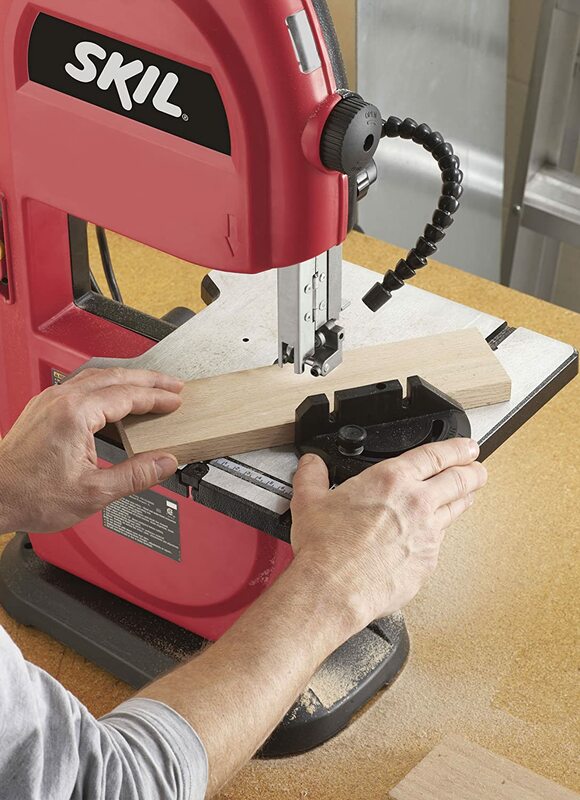 The first piece of valuable advice here is look to the 2-wheel bandsaws as your best buying option. The main reason a woodturner buys a bandsaw is to cut round turning blanks and rip down billets from logs. Ripping especially requires horsepower (kilowatts for you young fellas). A saw with less than a 1hp (750 watts) is going to struggle with green hard wood blanks. I have re-powered my small Taiwanese saw with a one horse motor and it is still barely adequate. Second bit of advice look for more than 1hp if possible. Some band saws have a series of pulleys to allow different ratios. This can increase the power of the saw but this is at the expense of cutting speed. I am unable to recommend a cutting speed but the speed suggested by the manufacturer for cutting aluminum is about right for hardwood. The average woodturner is usually either ripping down or cutting circles for turning blanks. It is my experience to suggest that course cutting blades are probably the best. Band saw blades are still classed in imperial measure. Teeth are classified in teeth per inch (TPI) or points per inch (PPI), see diagram for clarification. TPI is the most common method here in NZ. As a rule of thumb 3TPI is really good for woodturners. It will handle green wood and carry away the sawdust without excessive clogging. There is also a type of blade that has recently hit the market called "Extra-set". As the name suggests this blade has comes with much more set on the teeth than average and allows for tighter circles to be cut and really good sawdust clearing. Most band saw blade suppliers will know of this and will be able to supply Extra-set in 3TPI, I can really recommend this blade. To summarize let’s look at the requirements for your new band saw. Anything less than 6" (150mm) in cutting height is not going to be adequate. What do you need to start making money with woodworking?